SAN DIEGO, Calif. (Feb. 6, 2017) – It’s true: wolves have been the victims of bad press thanks to Little Red Riding Hood and Animal Planet. But for a group of Wounded Warrior Project® (WWP) warriors and families, grey wolves were a joy of the “W” animals theme at San Diego Zoo’s KinderNight’s Program. Wolves, it turns out, are too shy to be fairy tale villains. Warriors and families attend these gatherings to experience what is possible when they connect with fellow wounded veterans. The pizza party beforehand provided warriors with stress-free time to prepare for delving into the program. Then, guests enjoyed the sensory delights of the zoo: the feel of fur and scales under eager fingertips, the sugary scent of orange pumpkin squish, the trunk’s length view of massive elephants – and a bit of lively conversation with a chatty zebra. Navy veteran Christina Danley and her toddler enjoyed arts and crafts with a twist: they used snacks to build houses for the Three Little Pigs. Another highlight? Meeting a special breed of reptile: “The “ninja” turtle experience was very cool — my 3-year-old is a huge fan!” Christina said. Along with recreating military bonds, WWP gatherings highlight family unity. 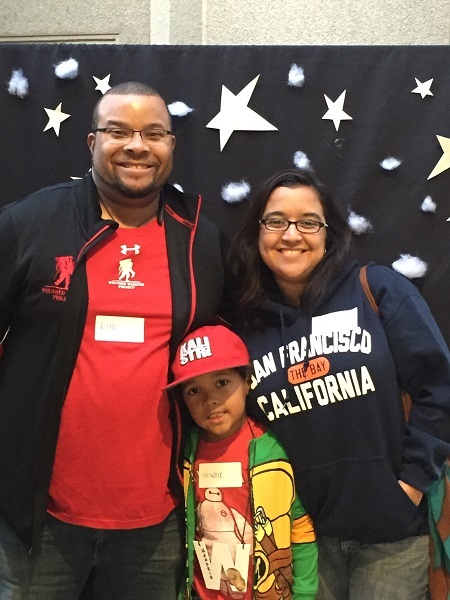 “My daughter and I still talk about what she learned and saw at KinderNights,” Roxanne said. For photos from this event, click on multimedia, then images.